Manchester United are set for a busy summer in the transfer market. Although Ole Gunnar Solskjaer is yet to be appointed manager on a permanent basis, the Norwegian is working alongside Ed Woodward to identify players that can help make the Red Devils a factor in next season’s title race. There are likely to be reinforcements in each department. Borussia Dortmund winger Jadon Sancho has been linked with an £80million move to Old Trafford while Napoli centre-back Kalidou Koulibaly continues to be mentioned among the gossip columns. But the midfield also requires strengthening. Paul Pogba, Nemanja Matic and Ander Herrera have become Solskjaer’s preferred trio in the middle but recent injuries have exposed United’s lack of depth in that position. The club has triggered the 12-month extension of Andreas Pereira’s contract and, while we’re hoping to see the best of Fred next term, a dynamic, goalscoring midfielder would be a welcome addition to the ranks in the summer. As it happens, United have been linked with such a player in the shape of Sporting Lisbon captain Bruno Fernandes. Here, we profile the Portugal international. Although Portuguese, Fernandes cut his teeth in Italy. He joined Novara in 2012 before joining Udinese a year later. After three years there, he signed for Sampdoria, but after one productive year at the Stadio Luigi Ferraris, he returned to Portugal with Sporting Lisbon. Having been overlooked for selection for the national side during his time in Italy, Fernandes’ emergence in the Primeira Liga coincided with the blossoming of his international career. Now, nearly two years on, Fernandes is Sporting’s captain and has 11 Portugal caps to his name. Not only that, his sensational form saw being named the Primeira Liga Player of the Year for 2017/18 and has propelled him into the spotlight, turning him into one of the most sought-after midfielders in Europe. Fernandes is a versatile, attack-minded player, the kind of player that can offer a different dimension to United’s midfield. He spent a large portion of his time in Italy operating as part of a three in a 4-3-3, the system favoured by Solskjaer. In this role, Fernandes became effective at finding the space between the lines of midfield and attack. For Sporting he has been predominantly used in a more advanced role, slotting in behind Bas Dost in a 4-2-3-1. United have a dedicated No.6 in Matic, someone who is willing to sit deep in front of the defence to allow Pogba to influence the game higher up the pitch. 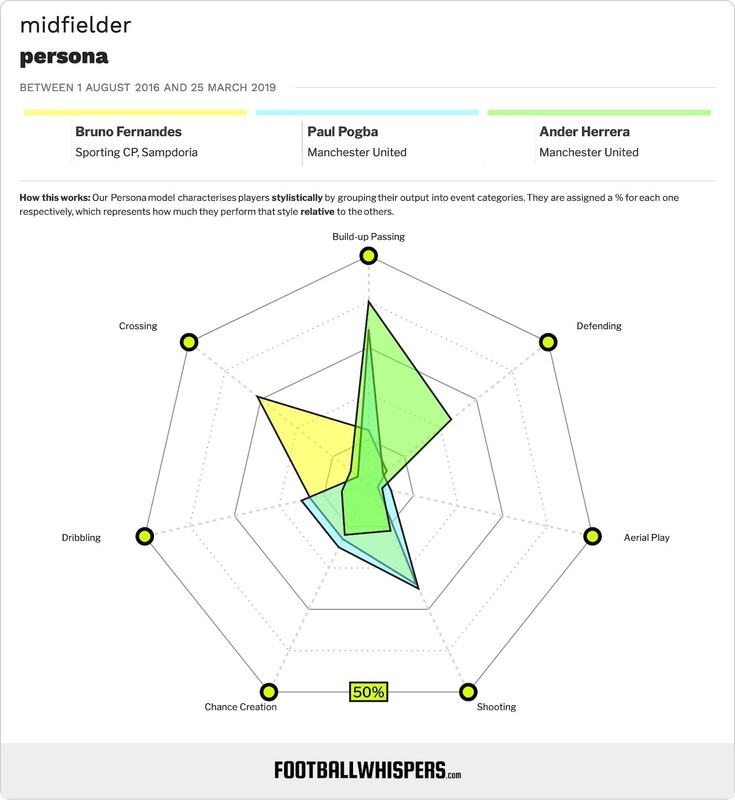 Although different from the Frenchman both physically and technically, Fernandes is the creative ‘link’, someone who, like Pogba, can quicken the transition between defence and attack. In fact, no player in the Portuguese top flight has completed more forward passes than the 24-year-old’s 498. He has also assisted more shots from open play than any other midfielder with 42 (1.62 per 90), notching ten assists in total. Fernandes likes creating but loves scoring. He has already comfortably surpassed last season’s tally of 16 with 24 in all competitions (only FC Copenhagen’s Robert Skov, with 25, can better that in European football). Boasting impressive predatory instincts, 11 of his 13 league goals this season have come from inside the opposition’s penalty area. He is also renowned for his prowess from distance, thanks to a flurry of goals from outside the box after joining Sporting in 2017. This season, no player has attempted more than his 50 shots from outside the box. An astute reader of the game, Fernandes often pounces on loose balls and finishes off crosses. It’s not luck; his ability to constantly pop up in the right place at the right time is down to intelligence and timing. Fernandes isn’t just an attacking dynamo, though. His rounded skillset is what has made him such an attractive proposition for potential suitors. Although Sporting often dominate possession in league games (averaging 57.4 per cent), the midfielder has shown he’s not above embracing the grittier side of the game. In fact, he has won possession on more occasions than any of his teammates during this season’s Europa League campaign while only two Primeira Liga players have won the ball in the middle third more than him. Importantly, though, he is Sporting’s captain in a team full of experienced campaigners. A natural leader on the pitch, Fernandes leads by example. In that respect, he is like Ander Herrera, only with added goals. Fernandes won’t come cheap. His buyout clause is reportedly £95 million and, under contract until 2023, Sporting are under no great pressure to sell. 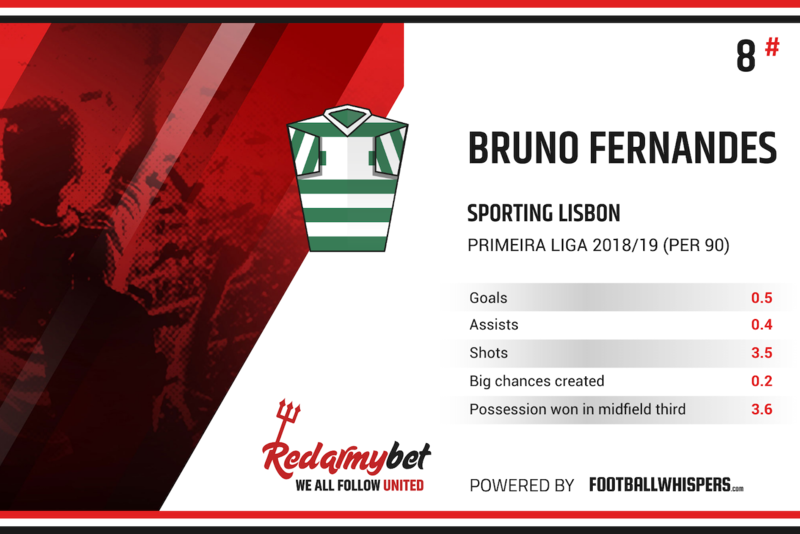 However, Fernandes is clearly destined for greater things than the Europa League and, if United qualify for next season’s Champions League, he may be open to a move to Old Trafford. With uncertainty over the futures of Herrera and Fred, Fernandes would be an ideal addition to United’s midfield. Creative, versatile, intelligent; he ticks all the boxes.